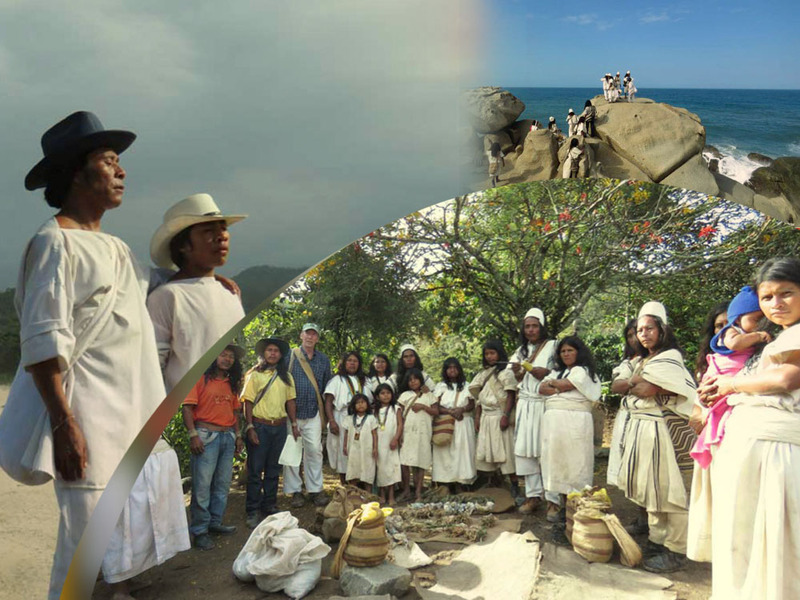 According to the “Law of Origin” of the 4 pueblos (Arhuacos, Koguis, Wiwas and Kanquamos) of the Sierra Nevada de Santa Marta (SNSM), the main responsibility of the Mamos (traditional elders) is to maintain the balance of nature in the heart of the world for the benefit of all. The SNSM is the highest coastal mountain range in the world, unique in its kind and recognized by its inhabitants as a “sacred house”, a “living being” which they care for so as to maintain the balance of nature throughout the world. The Black Line is a spiritual boundary that demarcates the ancestral territory of the four indigenous groups of the SNSM and forms a virtual triangle around its base, approximately 100 miles on each side, connecting 54 sacred sites. These sites connect energetically to many other sacred sites within The Black Line going all the way up to the snow-capped peaks. They all converge at the 18,700 ft. high peak of Mt. Bolivar (“Gonawindúa”), which is the maximum hierarchy within their traditional system of cosmogony. The purpose of the Mamos’ spiritual work is to make offerings at these sites in compliance with their “Law of Origin”. The Mamos have been making these offerings for millennia. This work, along with the closely related traditional practices such as The Taní Dance, birth, marriage and death ceremonies, is how they maintain the balance of nature and wellbeing of the communities of the SNSM, which they call “The Heart of the World”. The goal of The Elders Project (TEP) is to work with and provide support to the traditional authorities (Mamos) of the Sierra Nevada de Santa Marta (SNSM) in Colombia for projects aimed at strengthening their traditional practices. TEP will provide this assistance primarily through funding those projects the Mamos deem necessary for the protection and preservation of their culture and ancestral lands in accordance with the “Law of Origin” of their ancestors. Arhuaco, Kogi and Wiwa Mamos journey to sacred sights along the Black Line to Harmonize the Earth. Watch this 3 part video about the Black Line Journey, supported by The Elders Project and Sacred Fire Foundation.